So, you are considering giving solid foods to your baby. Are you not sure if he or she is ready yet? Are you not certain just what and how to feed him? Here are some top tips for introducing solid foods to your baby. While there are signs and behaviors that indicate baby’s readiness for solid foods, if you find out that the transition isn’t going smoothly, experts generally agree that backing off and returning to breastfeeding or formula for a time is not a problem. In fact, looking at the first stages of solid food feeding as a no-pressure introduction may help everyone. Here are some signs that will help you know when it’s time to start on solids. He’s at least 6 months old. The American Academy of Pediatrics says 6 months is the minimum age to start solids, even if baby shows an interest earlier. He can hold his head steady. He doesn’t push food out of his mouth with his tongue (the “extrusion reflex”). His birth weight has doubled. He seems to be eating more often, and has an increased appetite. He shows great interest in other people eating, and wants to take food from plates (or hands, or forks!). Soft fruits mashed, such as peeled plums, pears, peaches, etc. Experts warn that common allergens should be avoided during this sensitive introductory stage, particularly wheat, egg, dairy, and peanut butter. Once it’s confirmed that baby doesn’t have any sensitivities to dairy (some pediatricians say to wait until baby is a good year old), then plain yogurt is a healthful introductory dairy food. Homemade food may be healthier; you know what goes into it, and you can choose a variety of foods. Homemade food may result in less pickiness as baby grows because of varying flavors and textures. Jarred food tends to cost a lot more. Homemade food can be challenging to prepare ahead and transport. Homemade food is more eco-friendly. Jarred food may be lower in nutrients due to high heat during processing. 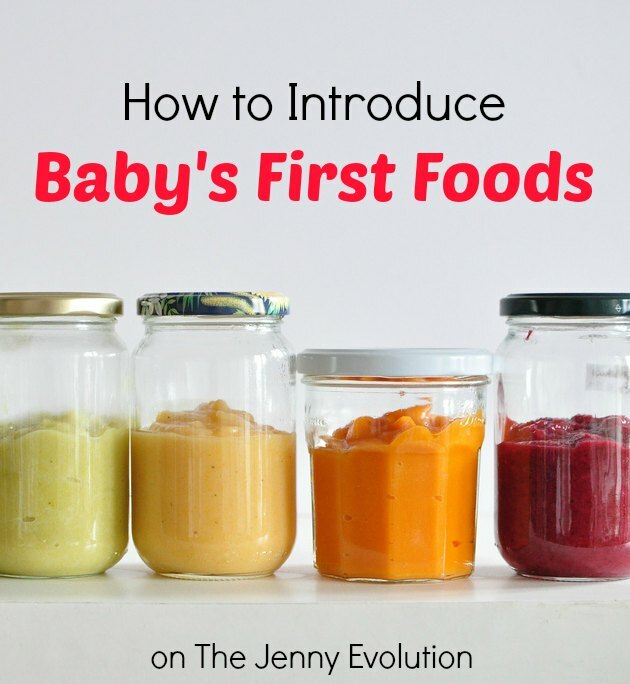 Whether you choose to feed jarred or homemade baby food, it’s important that your baby gets lots of positive interaction during meals and healthful varieties of foods. 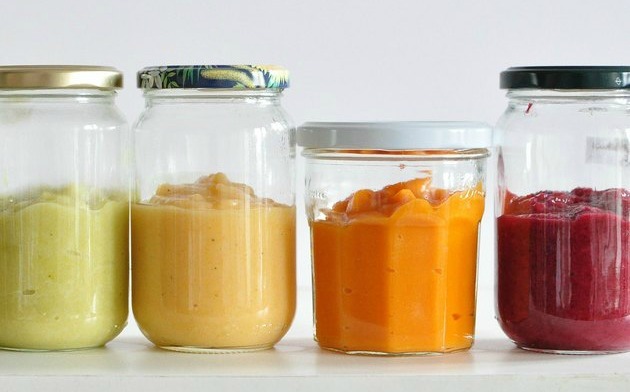 And a combination of jarred and homemade is a nice compromise (you can reuse the jars to store your own homemade baby food!). What to start as the first food is always a dilemma, huh! We stumbled across the concept of baby led weaning, which skips the purees/baby food and just goes straight to table food. Loved the flexibility of it… and my son never had any issues with food. I think his first solid was an apple slice; granted, he just gummed it and sucked the juice :). Great info. 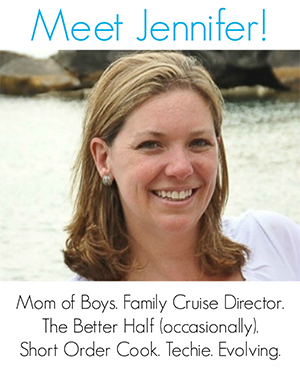 There is so much more information now for parents, than when I had our son…years ago. Thanks for the info and for hosting. This is great! My son just started on baby foods. Thanks for sharing! Great tips. Thanks for sharing them at the Inspiration Spotlight party. Shared.